The requirements of transport processes have become increasingly complex due to shorter transit times, the individual qualities of shipments, and higher amounts of small sized orders. Especially in courier and express services providing same day deliveries, the high degree of dynamics even increases this complexity. To ensure reliable and flexible planning and control of transport processes, we present a reactive and proactive agent-based system to support the dispatching of logistic transport service providers. Beside the application in simulated real-world processes of our industrial partners, this paper focuses on the impact and relevance of shortest-path queries in the system. We compare the application of state-of-the-art algorithms and investigate the effects of high speed shortest-path computations in agent-based negotiations. 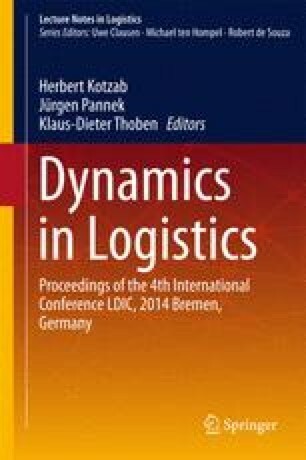 The results prove that efficient shortest-path algorithms are an essential key component in agent-based control of dynamic transport processes. The presented research was partially funded by the German Research Foundation (DFG) within the project Autonomous Courier and Express Services (HE 989/14-1) at the University Bremen, Germany. We thank our industrial partners for great cooperation and Stefan Edelkamp for great discussions.